If one sees the title of this disc one is probably inclined to expect Italian instrumental music from around 1600. However, a look at the track-list reveals that we get something quite different. Josquin Desprez, Jacob Obrecht and Adrian Willaert are household names among lovers of renaissance music, but they are not exactly associated with the violin. 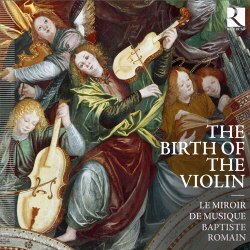 The purpose of Le Miroir de Musique which presents here its first recording, is to shed light on the role of the violin during the course of the 16th century. The very fact that the violin participated in the musical life of that time is generally acknowledged, but the instrument is almost exclusively associated with dance music. However, in his liner-notes Baptiste Romain states that it was largely in the second half of the century that the violin tackled this kind of repertoire. In the first half it was used in performances of instrumental pieces of a polyphonic character, such as ricercares (Obrecht, Recercar) or carmina (Ghiselin, Carmen in sol) and in instrumental performances of vocal music, especially motets. The vyolon - as the instrument was first referred to in 1523 at the court of Savoy - was not quite new as it united several features of instruments like the rebec, the lira da braccio and the vielle. In the second quarter of the century larger instruments were built in different ranges. The 16th century saw the ascendancy of consort music, not only for consorts of recorders, but also for viole da gamba and of violins. Italian musicians brought the latter to England where they were played as an alternative to the viol consort. The programme here includes pieces by representatives of the Franco-Flemish school and by native Italian composers. Vocal items are either performed with instruments (Juvenis, Salve Regina Misericordie) or in a mixture of solo voice, singing the upper part, and instruments. The latter scoring is practised, for instance, in Josquin's Missus est Gabriel and Regis's Ave Maria. In Juvenis' motet the instrumental performance imparts great transparency which allows for every single part to be heard. Also notable is the subtle dynamic shading. The Italian pieces are either madrigals or so-called laude, pieces of a more or less popular character which were sung at the brotherhoods (laudesi). Salve, sacrata by Filippo da Lurano belongs to this genre, and a performance with a solo voice and instruments allows the former to add ornaments. Sebastiano Festa is represented by two madrigals: Se'l pensier che mi strugge is sung, Amor che me tormenti is played at the violin, which takes the role of the voice and adds ornaments. La Rose by Adrian Willaert is performed here with ornamentation by Giovanni Bassano, an example of the diminution practice of the late 16th century. The pieces by an anonymous composer and by Francesco Bendusi are examples of the violin's involvement in dance music. The latter's dances are from a collection of instrumental music printed by Antonio Gardane in Venice in 1553. This disc gives an excellent survey of the various ways in which string instruments, including the renaissance violin, were used in musical life of the 16th century in Italy. It is highly interesting from a historical point of view as the role of the violin in the renaissance is still underexposed. It is also most satisfying from a strictly musical perspective: the programme is well put together, with an interesting and varied sequence. The performances are outstanding. This is singing and playing at the highest level. The liner-notes are informative and give much insight into the historical context of instruments and music. All the ingredients are there to justify the labelling of this disc as Recording of the Month.